There have been several Da Vinci Diamonds slots released from IGT, although many still consider the original the best, even if it is beginning to look a little dated. This slot contains a host of useful symbols, include the titular diamonds, as well as some of Leonardo’s more famous portraits. 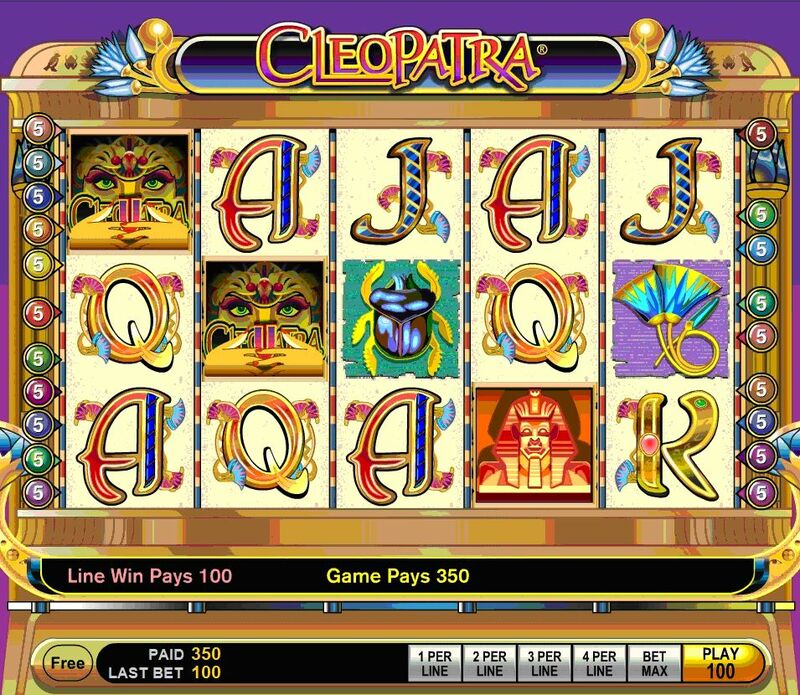 The slot also offers a tumbling reels feature, which is well-loved, amongst other special bonuses. 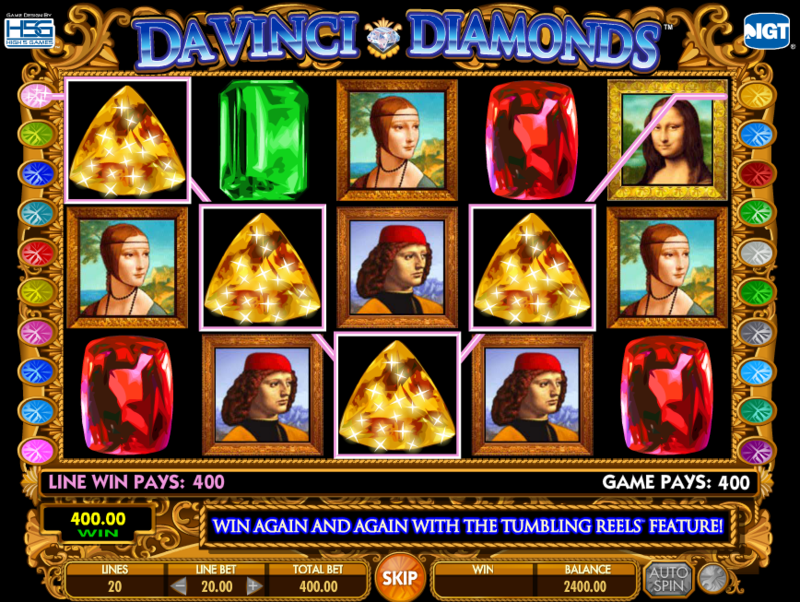 Da Vinci Diamonds is played over a total of 5 reels, with 20 non-adjustable paylines spread over those. Players are ultimately able to choose their line bets, which range from 1 coin per line, up to 100 coins per line. When you weigh up, Da Vinci Diamonds is going to cost you anything from 20 coins per spin, up to a whopping 2,000 coins per spin. Tumbling Reels: First, let’s talk about the Tumbling Reels. 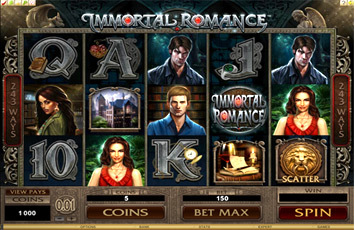 These are the main feature of the game and are available on every spin. After any spin, the Tumbling Reels feature will eradicate all winning icons, and drop down new symbols to replace them. In doing so, players can win continuously with new icons, without having to wager on new spins. Once there are new winning combinations left, the Tumbling Reels feature is over, and a new bet must be staked. Wild icon: The wild is not hard to spot in Da Vinci Diamonds. It is a picture frame with “wild” written inside it. This wild symbol can replace all other icons in the game, the only exception being the bonus icon. Wilds do not offer cash prizes on their own in Da Vinci Diamonds. Bonus icon: The free spins bonus is quite important to the player. It can appear on the first, second and third reels of the game, and when it appears on all three at once, it will trigger a free spins bonus. Free spins: Players will start out with just 6 free spins, although they can win more by landing 3 more bonus icons on the reels. In the free spins bonus, bonus icons can appear on all reels. Three additional ones offers 2, 3 or 4 extra games, whilst 4 bonus icons offers 4, 6, 8 or 10 free games. Land an additional 5 bonus icons during this bonus to pocket 6, 8, 10, 12 or 15 extra free games. The bonus will end either when the player has run out of spins, or when they’ve won a total of 300 in all. New symbols are used in the free spins bonus, and three portraits act as scatter icons. They count wherever they land. The maximum win you can acquire in Da Vinci Diamonds is 5,000 coins. You will need to line up 5 of the Da Vinci Diamond logos on any active payline to win this non-progressive jackpot. 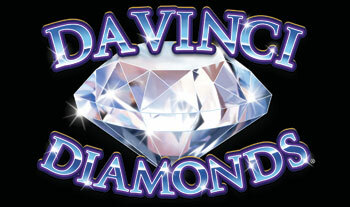 Da Vinci Diamonds is a fair slot, and one which has a theoretical pay-out percentages of 94.94%. You can have a lot of fun with this game, especially with its Tumbling Reels features. If you like this game, then why not try some of its sequels?